A desert warrior rises up against the evil army that is destroying his homeland. $36.075 million on 3444 screens. Does movie “product” get much more cynical than 2002’s The Scorpion King? Yeah, I suppose so, as plenty of flicks enjoy less reason to exist than this one. Still, I find it hard to not feel contemptuous toward an effort like this, since it feels more like marketing synergy than art. 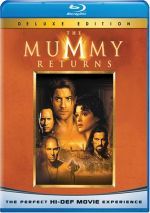 The Scorpion King acts as a prequel of sorts for 2001’s The Mummy Returns. In that flick Dwayne “The Rock” Johnson played a small role as the evil Scorpion King, whereas in this one, he portrays the same part as a hero. Buh? Anyway, King introduces us to Akkadian stud Mathayus (Johnson), part of a group who try to stop nasty overlord Memnon (Steven Brand) from ruling the known world. At first this acts as a mercenary mission for Mathayus, but when Memnon kills his brother Jesup (Branscombe Richmond), it becomes personal! With help from a weaselly thief named Arpid (Grant Heslov), Mathayus infiltrates Memnon’s compound. There he meets the sorceress Cassandra (Kelly Hu), a vital component of Memnon’s plan he kidnaps to use for his means. And blah blah blah. All of this does little more than build up to a bunch of fight scenes, including the requisite massive climactic battle. Mathayus and Cassandra fall in love, other goofy stuff happens, and a bunch of people kill each other. Did you anticipate anything else? I didn’t, but I still feel The Scorpion King becomes a disappointment, as it lives down to my expectations. I can pinpoint exactly when this movie lost me: at the two minute, 30 second mark. Mathayus enters a tavern to rescue his brother, and as the patrons nervously await his next move, he whispers “boo!” That moment seems like such a silly and lame attempt at humor that it made me immediately give up any hope the film might be better than I’d anticipated. The Mummy and its sequel offered a solid portrait of how filmmakers can make movies in the spirit of the classic Universal horror flicks but also add a modern edge. 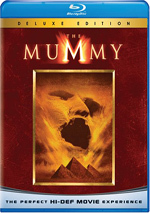 Though it used some of the same personnel, King feels like a cheesy rip-off of the newer Mummy movies. It goes through the same motions, but its attempts to capture the same tone seem forced and lackluster. Director Chuck Russell has proven the ability to create comedic action movies in the past. He did pretty well with The Mask and A Nightmare on Elm Street 3, and even 1996’s Schwarzenegger dud EraserEraser had its moments. However, Russell seems overwhelmed with all the pyrotechnics and sets involved here, and he never brings a personal touch to the proceedings. It diesn’t help that the actors all appear totally flat. Without question, Johnson is a charismatic guy, but he diesn’t come across that way here. He seems game and tries his best but just can’t do anything with the character. This means Johnson presents a strong presence but little else, and I feel the same way about Kelly Hu. She’s a gorgeous woman and she looks great, but she reads all of her lines in the same emotionless monotone. Maybe she downplayed her part so she wouldn’t upstage Johnson. The Mummy flicks paid homage to earlier films, but King came across like nothing more than a rip-off. As with The Mummy, it showed many Indiana Jones inspirations, which means one bit where Mathayus avoids death behind a rolling gong totally steals from the opening to Temple of Doom. King also tosses in a lot of James Bond overtones. In fact, Cassandra seems like a direct copy of Jane Seymour’s character from Live and Let Die, right down to her virginal bones. Ultimately, The Scorpion King feels like nothing more than a stale and joyless rehash of many superior movies. I liked the two Mummy flicks that preceded it, so I guess I fell into at least part of King’s target audience. However, the movie did nothing for me. 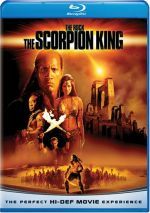 The Scorpion King appears in an aspect ratio of approximately 2.35:1 on this Blu-ray Disc. This was a watchable but inconsistent presentation. Sharpness became one of those up and down elements. Though most of the movie showed positive delineation, occasional soft spots interfered, elements that seemed influenced by bouts of light edge haloes. In general, the film appeared “digital”, as in addition to the haloes, I felt noise reduction gave the movie a lack of great detail and “smoothed out” some components in an unnatural manner. I saw no moiré effects or jaggies, and print flaws seemed minor, as I noticed only a couple of small specks. As expected, the film opted for a fairly sandy palette, and the colors looked acceptable. They could feel a little heavy but they were still good much of the time. Blacks looked dark and tight, but shadows tended to be a little too dense. This ended up as a passable image but not one that impressed. On the other hand, I felt much more impressed with the film’s DTS-HD MA 5.1 soundtrack. Not surprisingly, it featured an active soundfield, so all five channels received a brisk workout through much of the film. Of course, the many action sequences brought out the strongest elements. Swords clanged all about us, and arrows flew past us. The movie created a terrific sense of atmosphere and allowed us to become nicely involved in the action. Audio quality appeared positive. Dialogue remained natural and warm at all times, and I noticed no signs of edginess or problems related to intelligibility. Music seemed lively and bright, and the score showed fine range as well. The banging drums came across especially well in that regard. Finally, effects demonstrated solid clarity as well as good dynamics. Bass response appeared tight and deep throughout the movie. Overall, the audio for The Scorpion King lived up to my expectations. How did the Blu-ray compare with the original DVD? Audio showed more heft and range, and visuals looked tighter and better defined. Though various issues made the image a disappointment, it still fared better than the DVD due to the latter format’s limitations. 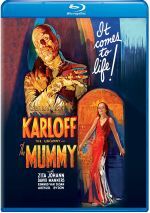 The Blu-ray includes some – but not most – of the DVD’s extras, and we launch with an audio commentary from director Chuck Russell. He offers an erratic running, screen-specific track. On the positive side, Russell covers a reasonable amount of information. He goes over a number of technical elements like sets, locations and effects, and he also chats about what the actors brought to their roles. In general, he seems fairly engaging much of the time. Unfortunately, these positives don’t come without plenty of negatives. For one, Russell devotes much too much of the track to plaudits for actor Dwayne Johnson. In addition, the track can be somewhat dry at times, and too many gaps appear. These don’t seem problematic during the film’s first half, but they escalate during the second one and become much more noticeable. Overall, Russell’s commentary remains listenable and frequently useful, but the various issues I noted make it average as a whole. Like many Universal Blu-rays, Scorpion King comes with U-Control. In this case, it gives us a picture-in-picture feature. Across the movie, we get behind the scenes footage, storyboards and comments from Russell, producer Kevin Misher, executive producer Vince McMahon, and actors Dwayne Johnson, Michael Clarke Duncan, Kelly Hu, and Steven Brand. The remarks look at story and characters, cast and performances, sets, Russell’s impact on the production, stunts and action. Don’t expect much from this mediocre picture-in-picture track. We mostly get storyboards, and they’re mildly interesting. The cast/crew comments tend to be superficial and tell us little. “U-Control” fails to add much to the package. What does the Blu-ray lose from the DVD? It drops an audio commentary with Dwayne Johnson as well as a mix of featurettes and other tidbits. I can’t claim I miss any of these – the Johnson commentary was awful – but I still think the Universal should’ve ported them over to the Blu-ray. I’ve seen worse movies than The Scorpion King, but this lackluster and silly action flick remains a disappointment nonetheless. It felt like nothing more than one big promotional opportunity and it never remotely engaged me. The Blu-ray offers excellent audio with mediocre visuals and a handful of supplements. Scorpion King becomes a totally forgettable adventure.